The games that will be referenced in this post are: Fallout 3, Ni No Kuni, and Modern Warfare 3. Turn away now to avoid reading further. Ready now? I’ll continue. Most video game stories begin with something terrible happening to the protagonist. Take for example Mario: Bowser comes and steals his beloved princess and forces him through peril after peril to come and rescue her. Typically there is no backstory as to how the hero got to that point in time, let alone any parental figures within that backstory or story in general. 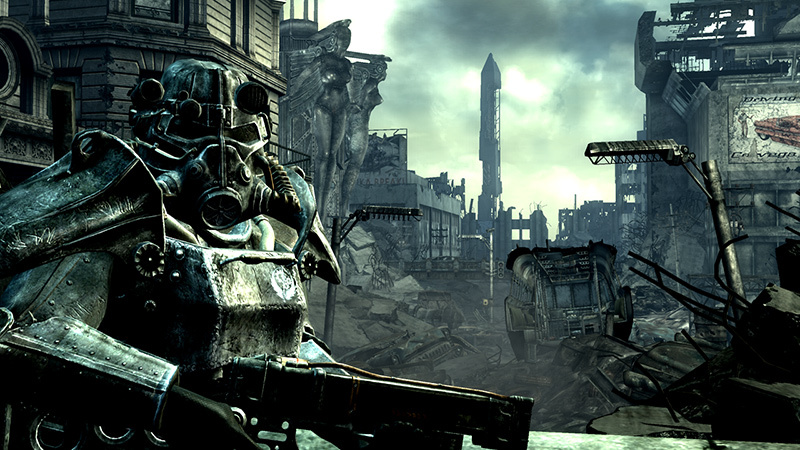 There are few games that break this mold, one of which is Fallout 3. The start of the game places you, the protagonist, at your point of origin. Yes, for those of you who haven’t played the game, you are actually watching the birth from the baby’s point of view. You can hear the sounds of your mom and dad talking to you, deciding on your name and what gender you are. From there the game takes you to pivotal moments in your characters youth up to the point at which you play through the remainder of the game without apparently aging a day. This being said, the main driving point behind the game’s story line is finding your dad, who left the vault without saying a word to you or anyone about why he was leaving. The game however does a great job of, while still allowing you to feel like something to be reckoned with, making you feel like you are a lost child wandering around, looking for your parents. 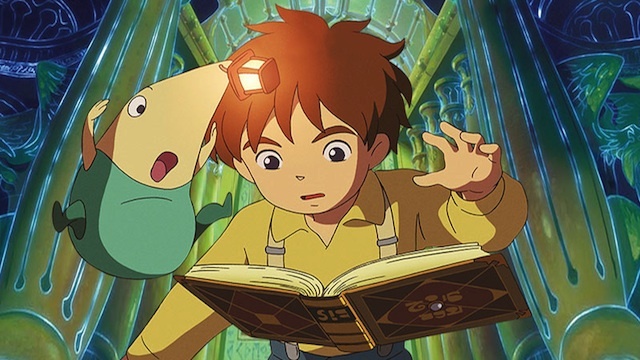 Another game worth mentioning, Ni No Kuni, places you in the role of an 11 year old boy Oliver who’s mother dies of a heart attack at the very beginning of the game. He, Oliver, then finds out that he has the ability to save her if he can rescue an alternate realm from total destruction. I’d argue that this can almost make the player want to continue the game, not only because the game in its very nature is fun, but because they feel some deeper connection to the character because of that parental figure that main character is now missing. There’s much more of an emotional draw from me the player as I watch my Dad die in Fallout 3, than there is for me when I watch Soap die in Modern Warfare 3. Part of the problem, and a counter point to what I have previously said, is that there is also a difference in the level of writing for each game and that one is clearly better than the other. Modern Warfare’s writing is by no means a reason for celebration, however it certainly isn’t bad and can still draw the player in with enough interest to finish the game and then buy the sequel upon its release. I believe that the connection that we have with our parental figures in real life, or family for that matter, makes us feel closer to the character in these games due to the fact that we start reflecting our own parents upon the parental figure in the game. Just like we don’t want to lose our parent figure in real life, we don’t want to see our character lose there’s either. At least while we have the power to do so. Parental figures have rarely appeared in games. From Mario all the way up through games such as GTA 4, we don’t really see much interaction with a parental type figure. While some games’ writing is good enough that they still draw emotion without a parental figure, I’d say that the added parental figure creates a new level of emotion and attachment to said characters. It adds another dimension to the story that I feel is forgotten in many places. But I’ll end this post with an example from Fallout 3: would you want to see your dad killed while creating clean water from inside the Jefferson memorial? I would assume not. ← Nobody’s Asian in the Gameverse? The points made in this article are similar to those made in cristina’s “Stick and Stones May Break My Bones But Virtual Characters Can Somehow Hurt Me?”. Granted, cristina’s article dealt with the player connecting with a child rather than a parental figure, but both rely on developing and capitalizing off of a player’s sense of empathy. As marnold pointed out, many games either have absent, out-of-focus, or neglectful parental figures. Pokemon is a notable combination of all three, since only one playable character has been shown to have a father (and even then, he’s always at his gym), while the mothers in each game do nothing more than make idle chit-chat during rare visits. Similarly, in Earthbound Ness’ father never appears, and his only contribution is enough money for Ness to survive the week. From these examples, it might be safe to conclude that parents in video games do not enjoy a decent reputation. However, The Legend of Zelda: A Link to the Past, builds empathy in a similar manner to what marnold described in Fallout 3. In this game, Link does not go adventuring immediately, and is told by his uncle to stay in the house while said uncle goes out to fight monsters. Of course Link doesn’t listen, and when he catches up to his uncle the player is treated to the experience of watching Link’s uncle die. While the player isn’t as well-acquainted with Link’s uncle as they are with the main character’s father in Fallout 3, there is a similar tenderness concerning how the scenes are played out. Link’s uncle’s actions, as well as his dying words, hit the player where it hurts. Whether or not parents or parental figures are portrayed well in video games collectively, there certainly are exceptions, and we will likely see more of these exceptions in future games. I would be careful with making gross generalizations such as “most video game stories begin with something terrible happening to the protagonist.” Although I would argue that game narratives often reveal some sort of objective for the protagonist to be involved in the game, I wouldn’t necessary say this is true for most video games. I also wouldn’t say that these player objectives are all fueled by a “terrible” occurrence. Having said that, I do understand what you’re trying to say with your argument about parents. Providing characters with a back-story makes him or her more realistic and therefore more sympathetic to those playing the game. As you said, “the connection that we have with our parental figures in real life…makes us feel closer to the character.” However, the inclusion of parents in a game narrative is not a requirement for a relatable, sympathetic character or a successful game. 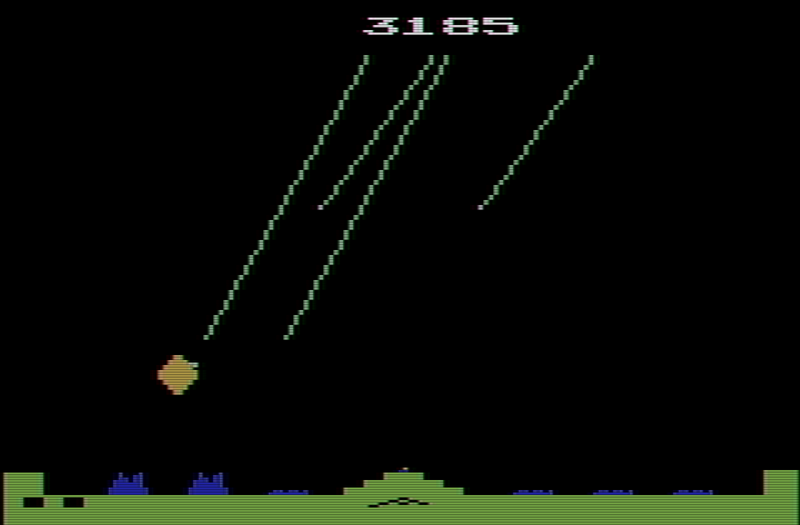 Although it is almost expected to have an elaborate story in today’s video game industry, we can look back at those early games with no obvious narrative qualities, such as Pong, and recognize their success. A joke I often make with my friends is that ‘No one has parents in anime’ and that seems fairly applicable to games. Either the parents are gone and the protagonist is alone or in the care of someone else, or the parents are off-screen/rarely seen. That said, I don’t think the lack of a parent provides more empathy than other plot can. I almost think that killing off a parental figure is a quick and easy (not necessarily good) way to try and make the player feel for the protagonist. At times it can come off as ‘okay, everyone has parents or parental figures so if we make them witness the death of the character’s, they’ll sympathize with them.’ Well yes, we will feel bad for them and accompany them on their quest to save or avenge their parental figure, but that doesn’t mean it was A+ Quality Storytelling. Don’t get me wrong, I adore Ni No Kuni and other games where the parents are gone, but after a while the dead parents gimmick starts to feel overused. I know I’m supposed to feel bad for the character after their parents are killed/kidnapped/etc, but if it’s not executed right I just don’t feel the connection I’m supposed to. Basically I guess what I’m saying is that if you’re going to off a character’s parents, do it well, develop a decent story around it, and make me really feel for the protagonist. Don’t just use it as the lazy writer’s trick for empathy. Video games try so hard to evoke emotions in players, so why do you think that the inclusion of a parental role is so rare? It seems to me that there are two likely reasons for this. When you take away the parents, then you force the child to adapt and overcome. If you’re running through Fallout and your dad is sitting there teaching you how to deal with ghouls, how to collect mole rat meat, how to build dart guns, eventually you’re just going to ask why the hell doesn’t he just go and save the wasteland? Nobody’s going to be impressing upon you the importance and gravity of your quest if everybody expects your dad to do it all. Now, often there are situations in games where your mentor is expected to save the day, but generally they fail in some way and you end up having to continue to grow on your own and deal with everything yourself anyway. People are quick to hide behind their parents, and taking that away (as they do in Ni No Kuni and Fallout 3) is a shock to their basic instincts. 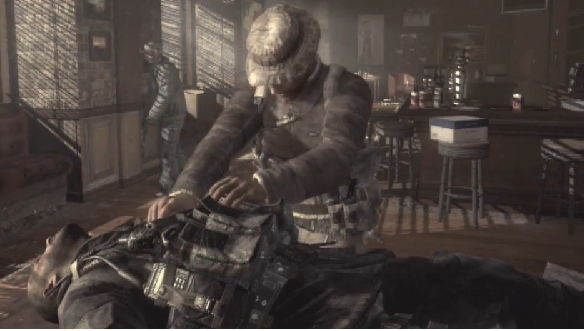 The other point, more applicable to the non-father father figure of Captain Price in relation to Soap, is that everybody has a different relationship to their father. There’s a social meme of “good” parenting, but really every child is inherently different, and as such every child requires different behaviors from their parents in order to grow; this totally overlooks the fact that many children do not get that adequate parenting from their parents, usually because of abandonment or because of parents thinking that there is a single, uniform “good” way to raise their child (And, spoiler alert, it’s how their own parents raised them). So if some people are going to get attached to a loving mom character, some people are going to be attached to a rational and objective mother, and some people literally do not understand what it feels like to be loved by a mother, how the hell is Shigeru Miyamoto supposed to make you love a fake mom? Price is added not so much as a father figure, but as a father figure figure. He represents somebody who cares about you but is decidedly not your father, which I would argue that many more people can relate to (It’s certainly much more of a meme in media than actually good parents). I don’t entirely agree with you about the emotional effectiveness of Fallout’s opening scenes. I think the game somewhat quickly, lazily attempts at creating an emotional relationship with the father, instead using the nature of the situation to more organically build the base stats and core values of your character. A majority of the opening scenes with the father twist reality into making you choose your character’s attributes, name, and the like. 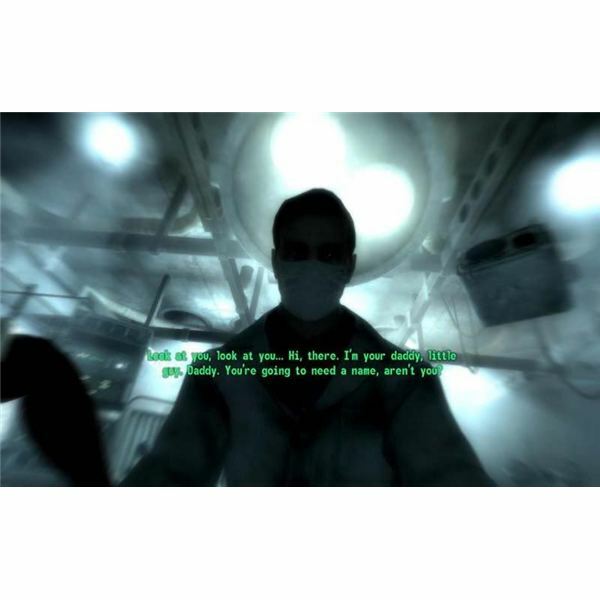 Take the screenshot from your piece, when the father says “you’re going to need a name now aren’t you?” The player is immediately prompted to choose their name following the dialogue. Of course the story still primarily revolves around the player finding his father, so such attempted emotional ties are obviously intended. I just don’t feel they are very effective, as the game consistently places the playing of the game above the story of the game. Many Bethesda games, due to their size, often feel this way concerning their main quests.